← Oh god, what the fvck am I doing with my life? 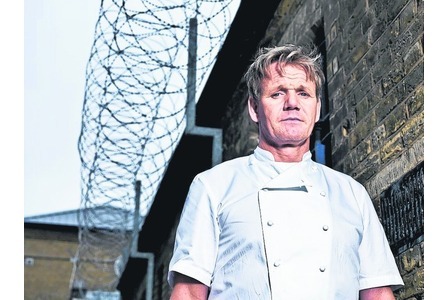 Despite not being a fan of Chef Ramsay I have a passion for food and more than a passing interest in the justice system so, I wonder, does Gordon have what it takes to set up a culinary business in HMP Brixton? Will Gordon’s confrontational and foulmouthed approach be a hit among the burglars, thieves and addicts or will chaos ensue? We start the show with a quick run down of Gordon’s family history and his hopes and fears for this pet penal project. This will no doubt draw comparisons with Jamie Oliver’s school dinners revolution but the moment Gordon walks into the prison, hands over his keys and phone he looks more vulnerable than Oliver ever did. Well, there were tears and the odd lip tremble from the Essex boy but our ex-footballer appears tougher than than – just. This isn’t a recipe show, a travel guide or competition. This is not fun. We get the voice over cliches and the swearing but [cliche alert] this has the potential to actually change lives (as apposed to a Masterchef banker quitting their day job to follow the culinary dream). Opting for a career change myself, I took some law classes and volunteered for a prison reform charity. I left just before a prison visit could be arranged and, I’ll admit, the prospect did freak me out. Ramsay’s earned more respect from me in 10 minutes than the last 10 years. But don’t worry, I’m not completely taken in … yet. The aim of the game is for Gordon to create a business in prison whereby inmates cook food good enough to be sold to the general public. Prisoners need to get off their arses and graft, learn a trade, give something back to the tax payer. So far, so Daily Mail but there’s no mention of re-offending rates. A nicer spin on this would be to depict the training of prisoners in the art of catering in order that they leave prison with a skill, get a job or further training and not to get pinched five months later. The first test for the 25 or so volunteers was to make Ramsay scrambled eggs. They were so bad, he could barely pick a final 12. But he did and the next test? “FAIRY CAKES!” The bad boys gaffawed but knuckled down nicely. One team made the cakes, the other marketed the product to sell to the screws. I’ve never been a keen baker myself but some of the decoration was pretty impressive! Things weren’t all sweetness and light however; one man kicked off because he didn’t have his ketchup and wanted it for their communal meal and food went missing at the end of their mammoth lunch shift. The lunch involved cooking chilli and chicken pie among other dishes for the 800 inmates. The head chef warned of impending trouble – these men don’t like change or to be messed with. The food has to please the prisoners because “our customers can’t go anywhere else” he says – can you imagine John & Greg bringing Masterchef quarter-finalists to a prison for dinner service? No, me neither. Leaving the prison charity when I did meant I missed out on the annual trip to The Clink which I really regret. Now, this is something that can change lives – set up within the walls of HMP High Down in 2009 by Alberto Crisci, the inmates prepare and serve up to 1,000 dishes a day for fellow convicts and the customers of The Clink restaurant. After a stint at Mirabelle, Crisci spent 11 years working in prison kitchens and more than 200 of the ‘staff’ have completed NVQ’s in cooking and hospitality. There was also A New Leaf, a florist located a stones throw from HMP Pentonville where a new trade was learned and hopefully steered offenders in the right direction. Unfortunately this enterprise closed in 2009 after 5 years. Can Ramsay replicate Crisci’s success or is it doomed from the start?